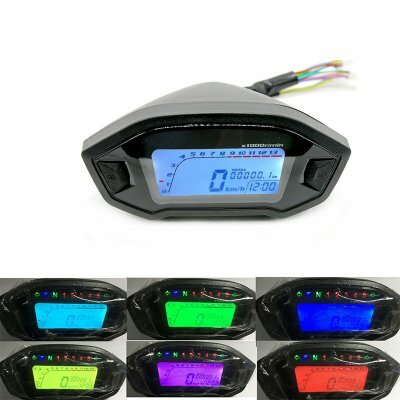 Successfully Added 12V Universal Motorcycle LCD Digital 13000rpm Speedometer Backlight Motorcycle Odometer to your Shopping Cart. -- As a practical equiment for your Motorcycle. -- Engine trouble light reminding. -- Easy installation and simple operation. Keys: Short press the left button to switch total subtotals. In the subtotal state, press and hold the right button for 3 seconds to clear the subtotal. Press and hold the left button for 2 seconds to flash. Short press the right button to switch between metrics and press the left button to switch to the clock. Set, the hour digit flashes, short press the left button to add 1, then short press the left button, the minute digit flashes, short press the right button to add 1, then press the left button to save and exit.